Digital Realty Trust, Inc. (DLR), a real estate investment trust (REIT), through its controlling interest in Digital Realty Trust, L.P., engages in the ownership, acquisition, development, redevelopment, and management of technology-related real estate. It focuses on strategically located properties containing applications and operations critical to the day-to-day operations of technology industry tenants and corporate enterprise data center users, including the information technology departments of Fortune 1000 companies, and financial services companies. I recently initiated a position in Digital Realty Trust, after selling my position in United Healthcare Realty Trust (UHT). Digital Realty Trust went public in 2004 and has been increasing dividends for eight consecutive years. 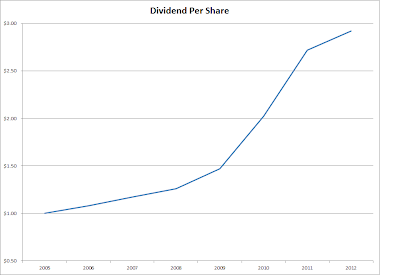 In less than two years, the company will be able to join the list of dividend achievers. The company’s top ten tenants account for 35% of revenues. The largest tenant is CenturyLink (CTL), at 9%. Tenant diversification is important; in order to reduce the impact on revenues if they broke the lease and the property had to be leased to a new prospective client. The REIT has an average original lease term of 13.60 years, and usually has an annual 2.50% - 3% cash rent increase on existing leases. Furthermore tenants are usually the ones responsible for power costs. The industries that Digital Realty serves include IT and Telecom Providers, as well as Financial and Corporate Service. In addition, this real estate investment trust also derives a good amount of revenues from European and Asia-Pacific operations, which together account for 21% of rents. Approximately 39% of gross rent is under Triple Net Leases, where the tenant spends a considerable amount of capital in data center infrastructure. This reduces the risk of breaking the lease by the customer. The beauty of triple net leases is that the tenant is the one who maintains the building. Approximately half of the revenues are derived from modified gross leases, where the REIT makes the capital investment in infrastructure. These offer a fully commissioned, flexible data center solution with dedicated electrical and mechanical infrastructure. Given the fact that technology changes fast, the risk with this revenue stream is that the company might have to make substantial capital investment to meet the power and cooling requirements of today’s advanced data centers, or may no longer be suitable for this use. 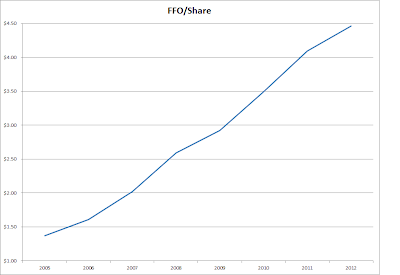 One key metric for real estate investment trusts is their occupancy ratio. An asset that is not leased is not generating any money and is costing capital and maintenance. Generally, it is important that companies are as close to maximum occupancy as possible. Digital Realty has managed to maintain occupancy between 94 and 95% over the past five years, which is impressive because it made a large amount of property acquisitions over the period, without sacrificing quality. In addition, the company has been able to renew 82% to 90% of leases that expired in 2012. Since 2009 however, cap rates have been declining and are reaching 7.60%, which is still not bad. If the company makes large acquisitions at decreasing cap rates however, future growth might not be as robust. However, with record low interest rates, the company has been able to tap debt markets at 3.625% to 4.25% for 10 and 12 year notes. 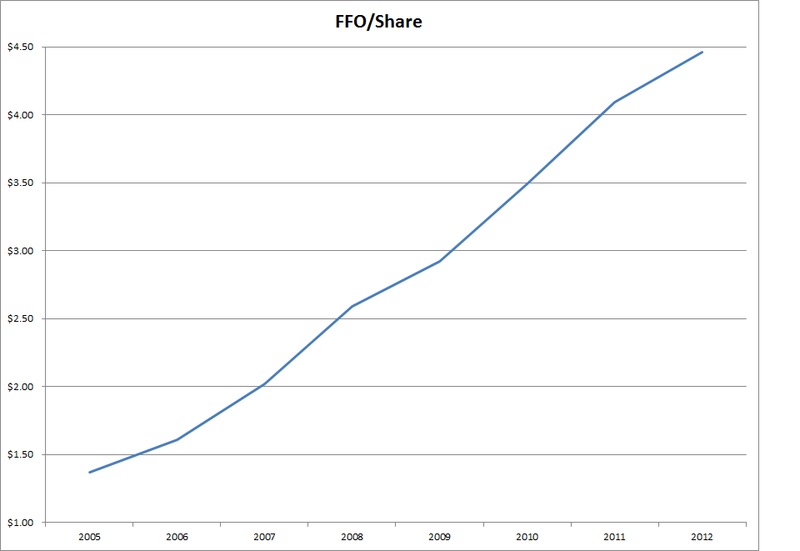 Digital Realty Trust has managed to increase FFO from $1.37/share in 2005 to $4.46/share by 2012. 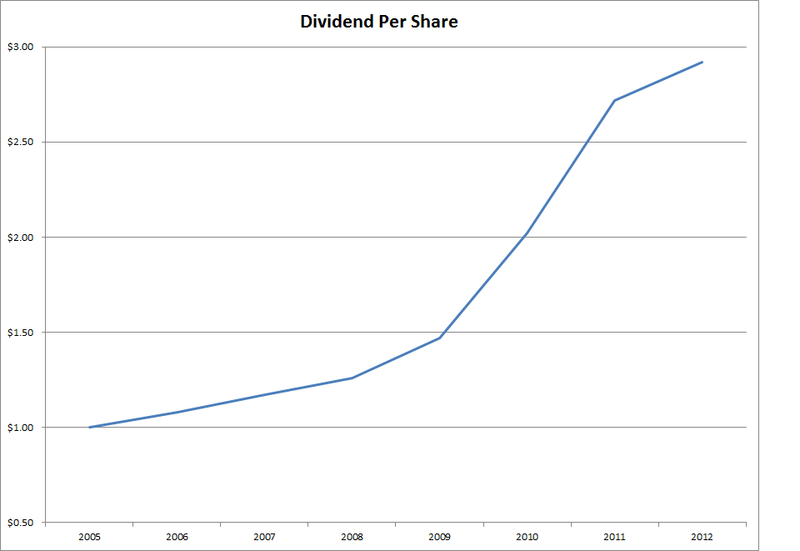 At the same time, distributions have grown from $1/share in 2005 to $2.92 in 2012. 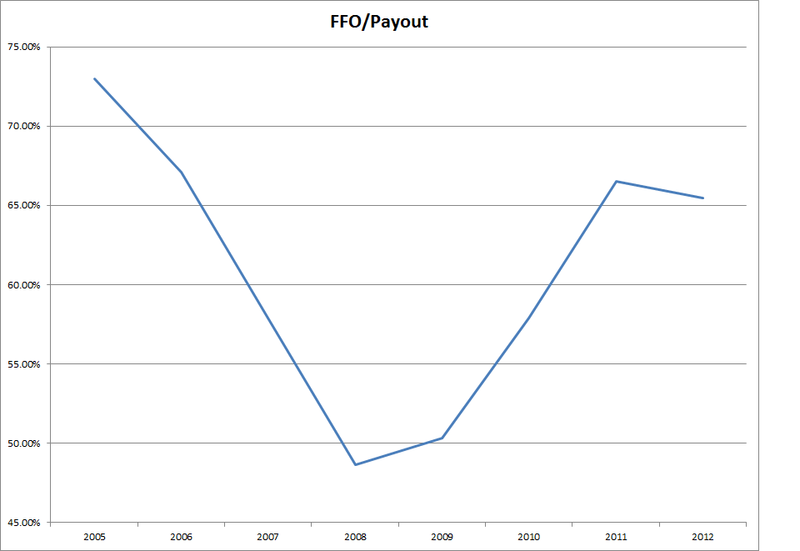 The company’s policy is to pay at least 100% of taxable income but no more than 90% of FFO. 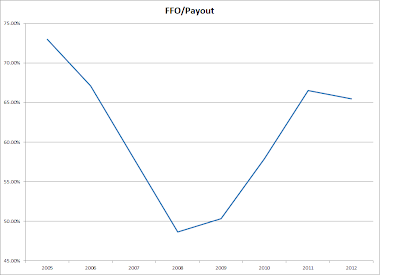 I find that there is adequate margin of safety in distributions, as seen through the trends in the FFO/payout ratio. Future FFO growth would be fueled by acquisitions made at attractive cap rates, while maintaining portfolio occupancy levels. The trust tends to obtain capital mostly through common share offerings. The low interest rates could offer a cheaper way to obtain capital for further expansion, that could be more beneficial to current shareholders. Given the current conservative capital structure, I see room for increasing leverage at fixed rates. Currently I find Digital Realty Trust to be attractively priced an 15 times FFO and yielding a very safe 4.70%.